Home Our Community Dicey is a year old! And giving away beers! Dicey is a year old! And giving away beers! Pattaya is certainly a hive of activity, and as the high season (yes, we will get one this year) approaches, the activity becomes even more frantic. Adding to the goings on, Dicey Reilly’s Irish Pub will be celebrating one year of operation on Saturday the 18th December 2010. Pub manager ‘Cat’ Brett feels that he has something to celebrate, with the returns from Dicey Reilly’s showing a very positive trend, and even though the pub is only one year old, it has already built up a steady group of regulars. Dicey Reilly’s will feature Lee Shamrock, one of the great entertainers, who agreed to come down for the one year party on Saturday Dec. 18. 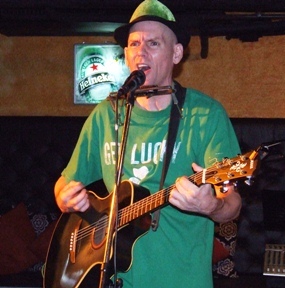 To celebrate, Dicey Reilly’s on the birthday Saturday will feature Lee Shamrock, one of the great entertainers, who these days is mainly in Bangkok, but agreed to come down for the one year party, having enjoyed himself so much a couple of months ago at the ‘half way to Paddy’s party’. Lee will be on stage from 7 p.m. until 11 p.m. If that’s not enough, from 7 p.m. until 9 p.m. Dicey Reilly’s will be offering selected beverages and finger food – all free! And that’s for nothing, to be sure, to be sure. Various free libations will include Magners, San Miguel, Heineken, Stella and free flow wines. There will also be special cocktails for the ladies during that time! So it looks as if it’s Dicey Reilly’s Saturday night 18th December, but don’t get there too late for the freebies! But do stay on and listen to Lee Shamrock, you won’t be disappointed. Previous articleAre you telling the truth?